Eating is something we all have to do, but in order to eat, we must cook – or get take out! But really, who can afford that everyday? Everyone’s lives are so busy these days, and cooking often becomes a tedious and stressful activity. If you’re feeling uninspired in the kitchen, check out Dana Velden’s book, Finding Yourself in the Kitchen; Kitchen meditations and Inspired Recipes from a Mindful Cook. The author recounts her time living in a Buddhist monastery and working in their Zen kitchen, where she re-discovered the simple joy of being in the kitchen, creating a meal. If that doesn’t work, have a look at the Cook by the Book’s latest cookbook reviews! Harriet liked the straight forward and easy approach of Easy Culinary Science for Better Cooking by Jessica Gavin. The book provides the science behind slow cooking which was helpful in making the Honey Hoisin Garlic Chicken. The Flaky Buttermilk biscuits turned out really well and were very tasty. Kerry discovered that deep frying a Reuben sandwich is a terrible idea! The Spicy Hot Russian dip that accompanied the sandwich was really good, though, and so was the Tangy Lemon Chicken from Bruce Weinstein’s The Kitchen Shortcut Bible. Jamie Oliver’s 5 Ingredients Quick & Easy Food cookbook has lots of pictures of all the ingredients you need, which Sandra really liked. She tried the Lemony Zucchini Linguine recipe, which was so easy to make and delicious! Easy Chicken Dishes by Addie Gundry uses a lot of prepared foods and dairy and very little seasoning, which Jackie didn’t like. The Kung Pao Chicken was easy, but required a lot of chopping and could have been spicier, although the heat did build when it was sampled the next day. Unfortunately, they couldn’t taste the lemon in the Lemon Chicken. Anita loved the gorgeous pictures in Back Pocket Pasta by Colu Henry and appreciated the simple recipes that all take under 20 minutes to prepare. This book is all about comfort food and the Rigatoni Pasta was the BEST THING EVER! The New Easy by Donna Hay contains a lot of unusual ingredients, but Prasanna would recommend this cookbook. She liked that the author shows how one recipe can be revamped and used for other occasions. The Sticky Korean pork with apple and cucumber pickle took 20 minutes to put together and was really good. Shirley enjoyed the little jokes that The Best of Bridge are known for in their latest Weekday Suppers cookbook. With new writers on board, you’ll find this cookbook is more adventurous than their previous books. The Thai Scallops Stir Fry turned out very well. Alton Brown’s Everydaycook features what the chef likes to cook for himself. Tatiana tried the Sardine dip and the Barley Water, which is purported to be very good for you. She didn’t like that you discard the barley at the end, which seemed a bit of a waste. Joanne loved Uncomplicated by Claire Tansey and would gladly pay full price for it! It contains the best Bran muffin recipe she has ever had, as well as this delicious Ravioli Lasagne, with a tasty tomato sauce. The Turkey Spaetzle Soup and Fire Roasted Tomato Soup from Fast From Scratch Meals by Betty Crocker, were simple to follow, with ingredients on hand and they were both delicious. The cookbook has tasty recipes that are simple to follow. It’s a great cookbook for preparing after work meals with fresh ingredients and kitchen staples. Sherri also tried the Greek burgers, which were a big hit with her family. The recipes in Dinner Illustrated from America’s Test Kitchen all take 1 hour or less to prepare and were really easy to make. Lynda and Maureen pickled their own vegies for the Tofu Ban Mi and declared the recipe a keeper. For the Fideos with Chickpeas they toasted the pasta first, giving it a nutty flavour. This recipe is a close cousin to Paella. Cathy liked that The Smart Dinner by Betty Crocker used ingredients she already had at home and gave lots of substitutions. The Udon Noodle Bowl was a little too spicy for her taste, but the Spicy Chili Garlic Shrimp Pasta was excellent. The Eggplant and Turkey Stir fry from Gwyneth Paltrow’s It’s All Easy was full of flavour and is definitely a dish I would make again. The cookbook is a typical celebrity cookbook with lots of pictures of Gwyneth and her family, but I have to say I liked all of the recipes I tried. Do you love browsing through cookbooks? You’re not alone! Cookbooks are consistently in the top ten subjects that are checked out at Winnipeg Public Library and are usually in the number one spot. Cookbooks currently make up 11% of Winnipeg Public Library’s non-fiction circulation – more than Psychology at 6% and Diet and Fitness at 4%. Fortunately, there are a lot of new cookbooks being published and the Cookbook clubs couldn’t be happier! Here’s a look at some of the new titles available at Winnipeg Public Library. Shirley already owns all of Ina Garten’s cookbooks, so she had to purchase her latest, Cooking For Jeffrey. Rosie also decided to review this cookbook and made the Camembert and Prosciutto Tartines, using tortillas instead of crusty bread – delicious! She also had a look at Alton Brown’s Everdaycook – a really fun book to read. It reads just like Alton talks on his popular TV shows. The Cucumber Lime Yogurt Pops call for 1 tsp. chile powder, but Rosie cut that in half and they still had a nice kick to them. Star Chef Recipes features several celebrity chefs, with nice pictures and simple, easy to follow recipes. Jackie made the Chorizo Meatballs, which can be served as a main course or as an appetizer. The stuffed mushrooms were easy and delicious, but could use a little less Herb d’Provence in them. The Happy Cook by Daphne Oz tries to do it all – Japanese, Italian, Gluten Free – all with a healthy twist. Oz uses a lot of fresh ingredients and offers good substitution options. Nadene made this really quick Kale, Sausage and White Bean soup for her family. Ed would recommend you check Mario Batali’s Big American Cookbook out of the library instead of buying it. The traditional Texas Chili contains no beans or tomatoes and involves making your own chile powder by re-hydrating dry chiles. 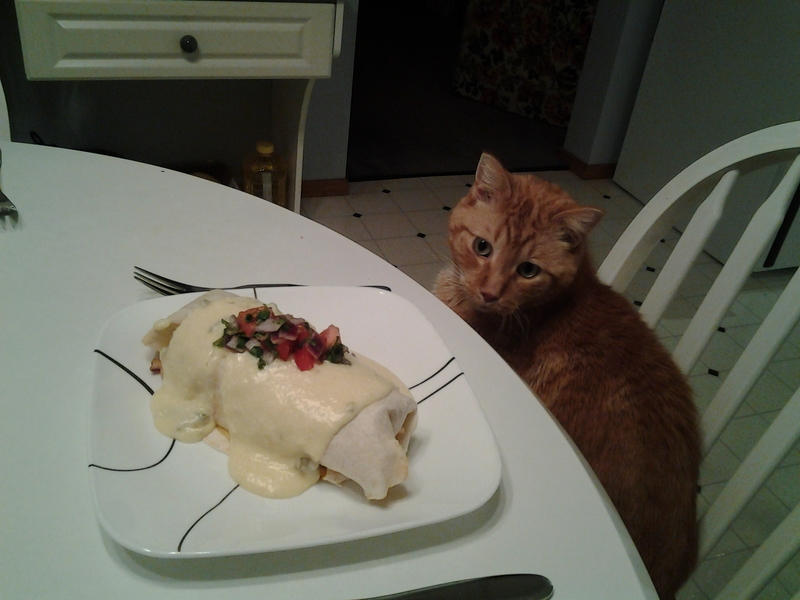 It was ok, but Ed prefers the Home Sick Texan’s recipe. Lynda and Maureen loved Chrissy Teigen’s Cravings. 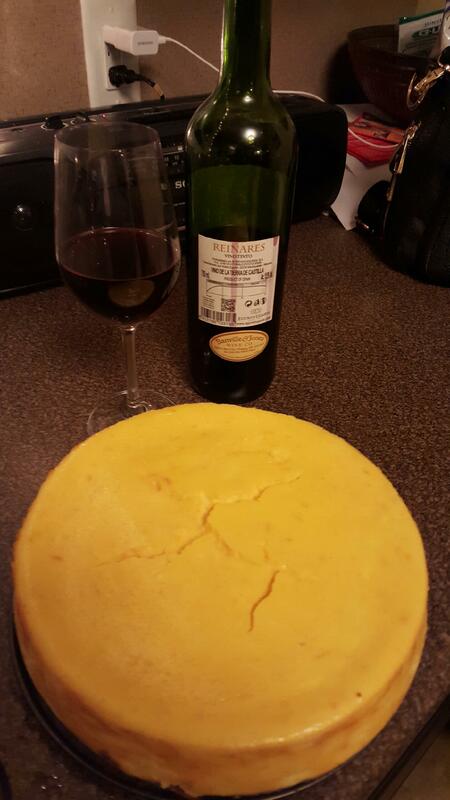 “All of the recipes we tried turned out fantastic and tasty. Chrissy has a refreshingly irreverent writing style with humorous, interesting comments about each recipe. She may be a supermodel but she’s got the appetite of a lumberjack, apparently.” They tried several recipes, including Chicken Lettuce Wraps, Shrimp Summer Rolls, Sweet & Salty Coconut Rice and the butter Lettuce Salad with Blue Cheese and Cayenne Candied Walnuts. How To Bake Everything by Mark Bittman is true to it’s title, providing lots of information and 2000 recipes! Dianne tried the Cornbread with Cheddar Cheese and Jalapenos and liked all of the different variations Bittman gives for his recipes. She also reviewed Oprah Winfrey’s latest book, Food, Health and Happiness and made the Turkey Burgers, which were well received. The Happy Cookbook by Lola Berry offers a whole foods approach to cooking, with gluten-free recipes, minimal dairy and no refined sugars. Margaret tried the stuffed mushroom caps, which tasted really good…with the addition of some bread crumbs. After borrowing Angela Liddon’s Oh She Glows Cookbook from the Library last year, I ended up buying it, so I wasn’t surprised that I had to buy her second book – Oh She Glows Every day! 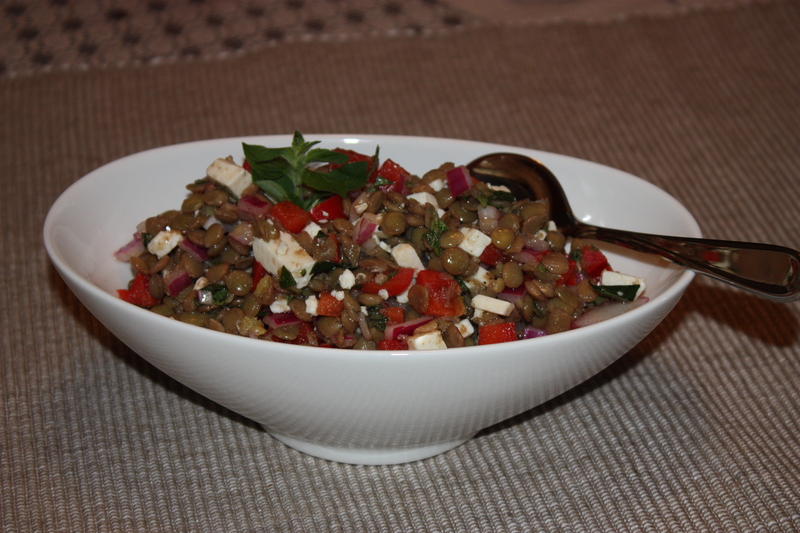 Liddon provides excellent plant based recipes that have become staples in our house. I recommend the Fusilli Lentil Mushroom Bolognese, with roasted red peppers, mushrooms and Tahini, which adds a nice creaminess and flavour. We’ve also made the Shepherd’s Pie several times and my new favourite – Vanilla Bean Coconut Macaroons. Well, are you anxious to get cooking? Borrowing cookbooks from the library is an excellent way to try before you buy. Happy cooking everyone! What do you think of as “Canadian” food? Do bacon and maple syrup top your list? How about bannock, poutine, butter tarts or Nanaimo bars? Our country is very diverse, so it’s hard to come up with one food that is quintessentially Canadian. We’re also very fortunate to have access to pretty much any food we want, any time of the year, from West coast salmon to East coast potatoes. Anita Stewart’s Canada contains great stories about Canada and would be a wonderful book for new cooks or newlyweds. Cheryl made several recipes, including a salmon dish and this decadent cheesecake, full of eggs, sour cream and orange and lemon zest, which was amazing. Dianne thought Homegrown by Marilyn Smith was an excellent cookbook. 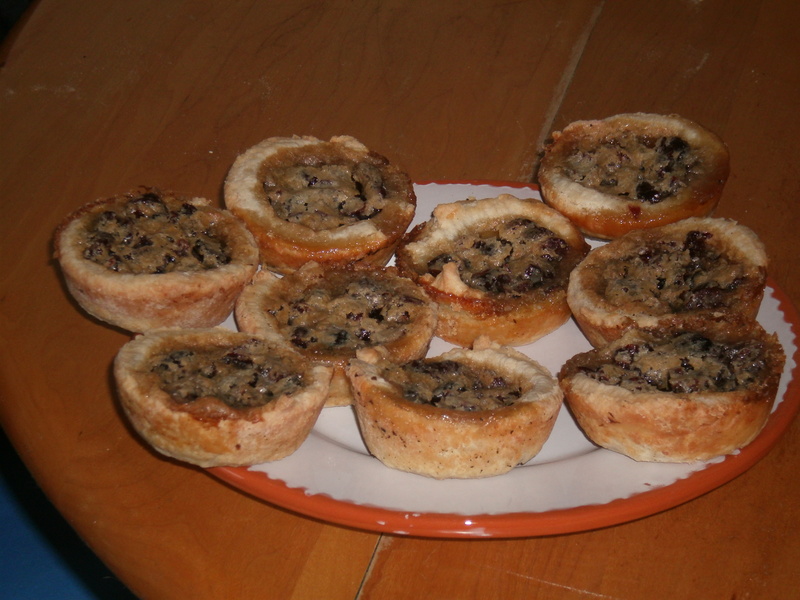 The Cranberry Maple Butter tarts were delicious, especially while still warm. They were a little on the sweet side, so she would use less sugar, next time. Lynda and Maureen had fun with You Gotta Eat Here, Too! They’ve eaten at several of the restaurants that have been featured on the show, including The Fiesta Mexicana Restaurante y Cantina, which is famous for their giant Burrito Guadalajara – the pico de gallo really makes this dish. 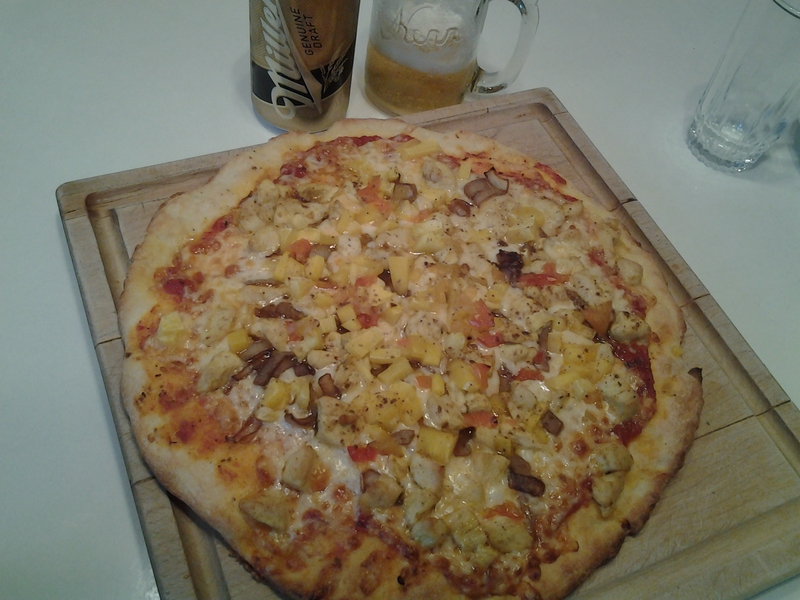 The Mango Tango Chicken Pizza from Mickey’s Dragon Pizza was fantastic. I chose John Catucci’s first book, You Gotta Eat Here! and tried Dottie’s Delicious lemon tart. The filling is a lemon curd with a hint of basil. 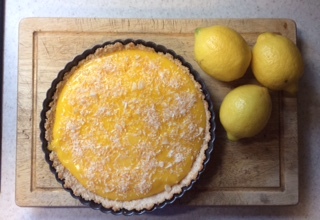 I used a gluten-free coconut crust, from Canadian Living Magazine, instead of the usual pastry crust. This TV show has been very successful and it’s great to be able to re-create some of these restaurant favourites in your own kitchen. Jackie thought The Dietician’s of Canada Cook would be perfect for a beginner cook, as it contains a lot of general information. 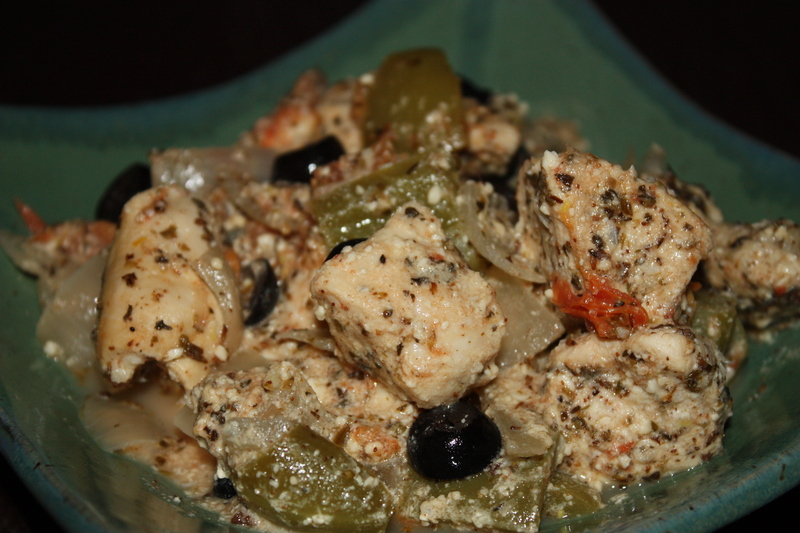 The Greek Chicken was a tasty, easy dish, that she would make again. 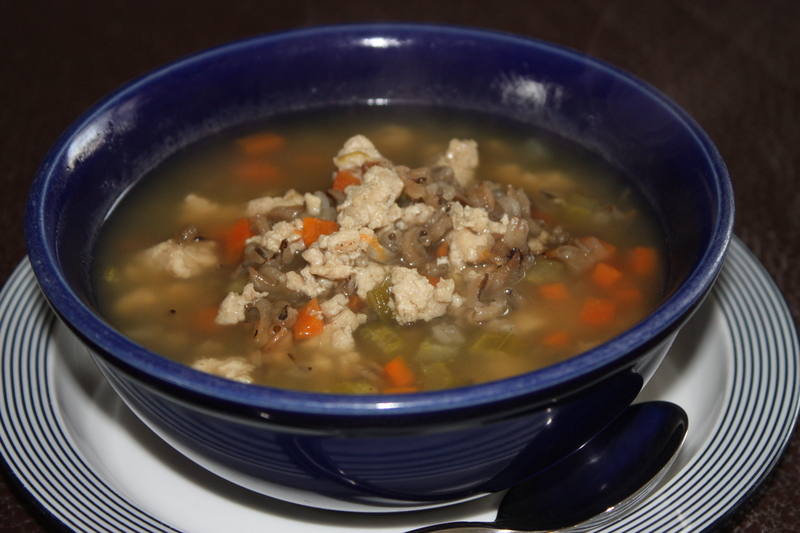 The Turkey and wild rice soup was a good, hearty soup that calls for ground turkey, but might be better with shredded turkey. Grandma’s Kitchen reminded Iris of her own mother’s recipes and uses ingredients that you probably already have in your cupboard. Ed was very happy with Michael Smith’s Back to Basics and his “pan-rushed” cooking method – a restaurant technique for getting food out fast. It involves searing the meat, making a sauce, then putting the meat back in the sauce to simmer. Winnipeg Cooks is a wonderful new cookbook showcasing our own city’s talented chefs. 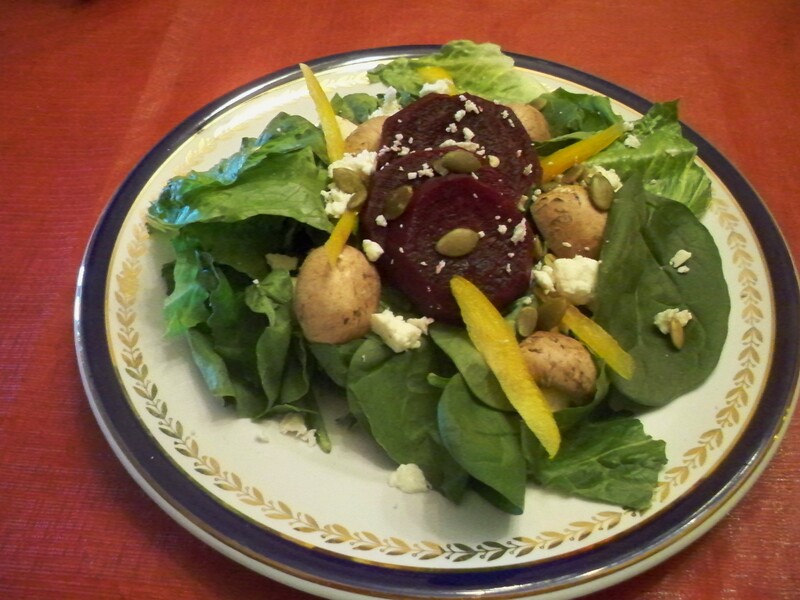 Rossita made this colourful Roasted Beet Salad. 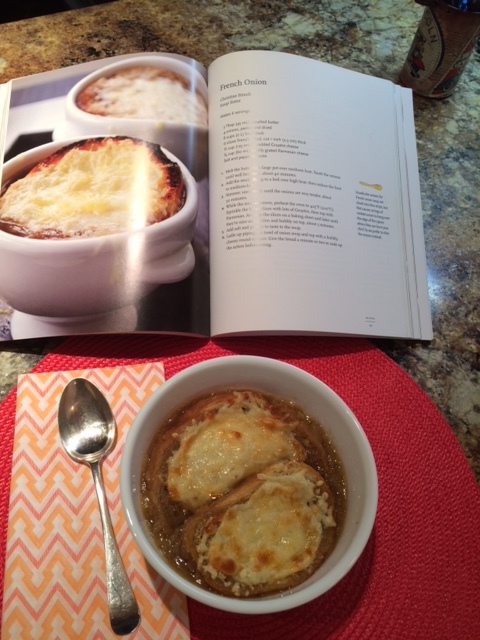 Sharla made the French Onion soup from The Soup Sisters, not realizing you need to cook the onions for 40 minutes. 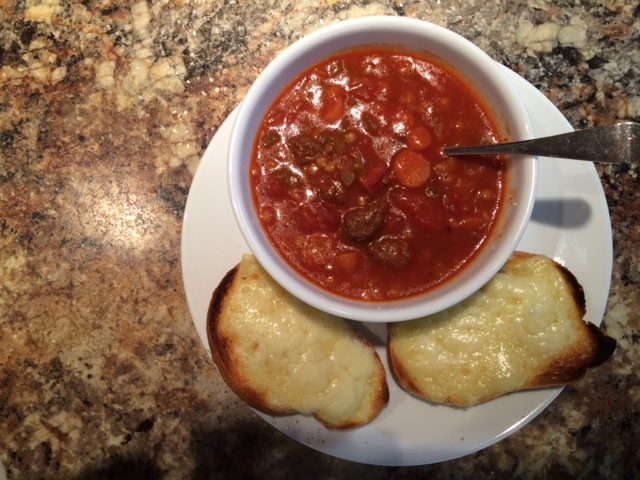 The end result was worth it and the cheese toast was also a big hit, so she made it again to go with the Hamburger Soup. The tomatoes were a little over-powering in this recipe, but nothing a little milk and hot sauce couldn’t fix. Next month we’ll be hosting the “Bean Team” of the Manitoba Pulse and Soybean Growers and learning about nutrition and the delicious possibilities of how to cook with pulses, for International Year of the Pulse. Please contact the Osborne Library at 204-986-4775 for more information. Aside from devouring a raw bison liver in his Oscar winning performance in The Revenant, Leonardo Di Caprio is an avowed vegetarian. Di Caprio helped to launch the 2015 Netflix film Cowspiracy, a condemnation of animal agriculture as a major contributor to global warming through production of methane gas, inefficient use of water, habitat loss and pollution from pesticide use. By avoiding meat, consumers also refuse to support an industry that raises animals in crowded pens, denies them fresh air and sunlight and then trucks them to inhumane slaughterhouses. Besides reducing one’s carbon footprint and promoting animal welfare, there are some other feel good reasons for adopting a vegetarian diet. Health benefits include weight loss, lowered cholesterol and blood pressure and reduction of the incidence of diabetes and heart disease. The key to a responsible vegetarian diet is to include a wide variety as no one food source is complete. For sound advice on kick starting your plant based diet consult Dietitians of Canada or Toronto Association of Vegetarians to ensure you include enough protein, Vitamin B12 and other nutrients in your diet. Check out one of the many vegetarian cookbooks Winnipeg Public Library has to offer. Here are some of the recipes tested by members of Fort Garry Library’s Taste Buds Cook Book Club who made a foray into the world of plant based foods. With a little effort it is easy to eat well, help to save the planet and embrace compassion for animal welfare. 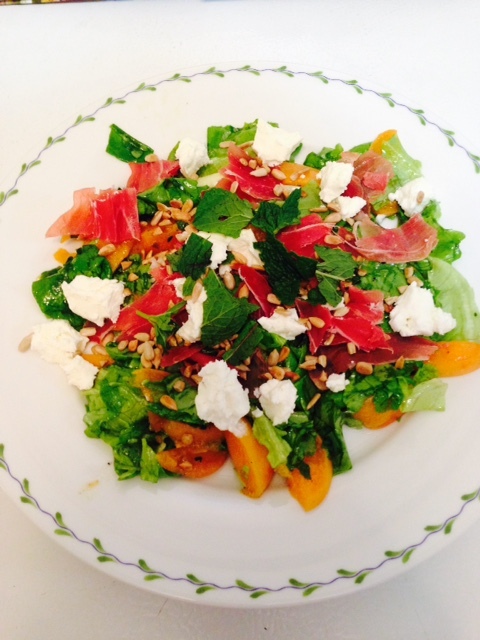 The Prosciutto Peach and Sweet Lettuce Salad, from Cooking Light’s Big Book of Salads, was Shelley’s favourite, she will definitely add it to her cooking repertoire. The other recipes she tried were really good, but anti-climatic after trying this recipe. 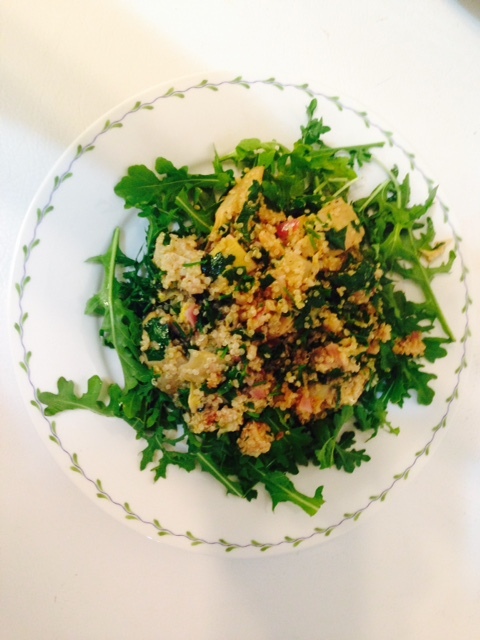 The flavours in the Quinoa Salad with artichokes and parsley were much better on the second night. 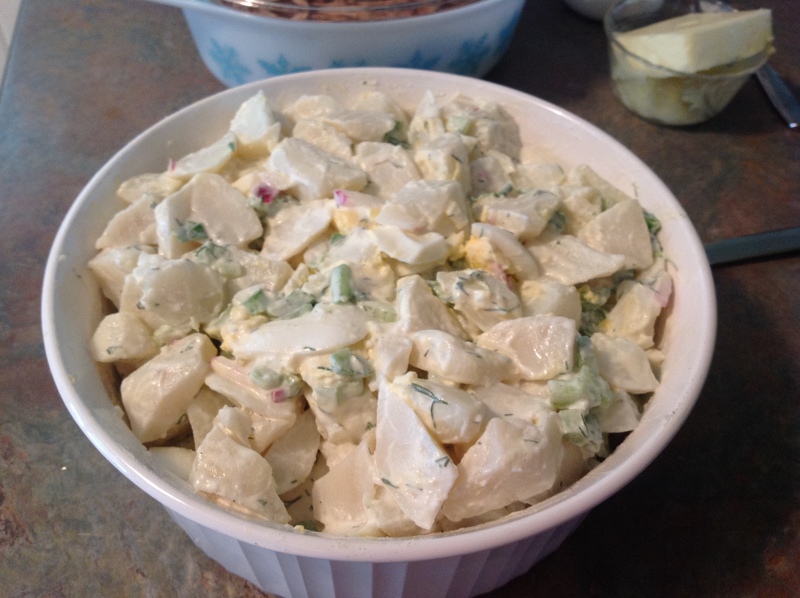 The Potato Salad from For the Love of Salad had a very nice flavour, but wouldn’t pair well with anything too strong-tasting. It wouldn’t be able to hold it’s own. Overall, Nadene loved the cookbook and would consider buying it. The Thai Beef Salad from Edible Garden Cookbook: Fresh, Healthy Cooking From the Garden was really good and makes a very generous portion. New Flavors for Salads: [Classic Recipes Redefined] covers all the classic salads, with new twists. 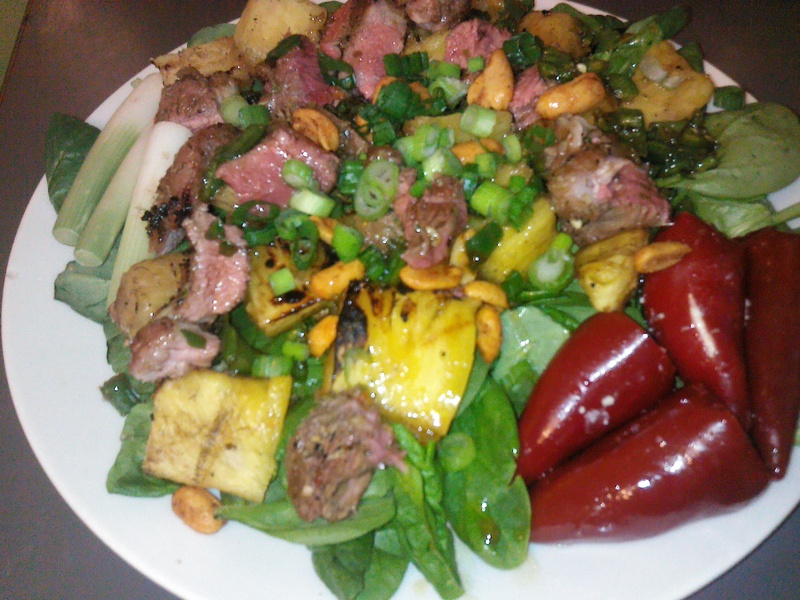 Craig learned an important lesson while making the Grilled Lamb and Pineapple Salad – always read the entire recipe first! You have to make the sauce first, which is on a different page. There are also how to instructions for cutting the pineapple and preparing the grill on separate pages. Twelve Months of Monastery Salads: 200 Divine Recipes for all Seasons contains easy to make recipes with wonderful quotes throughout the book. It’s a great book to browse through and Elaine didn’t want to return it. 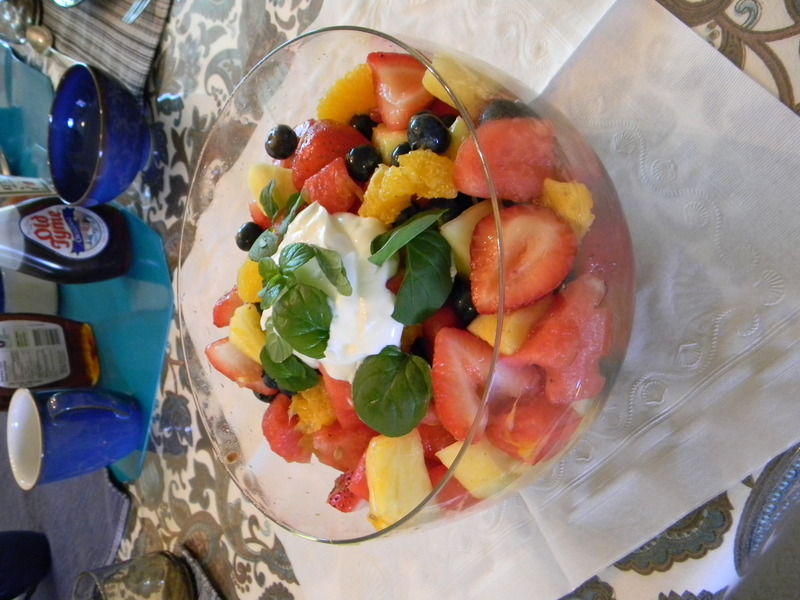 The Royal Fruit Salad was very yummy, with lots of fresh fruit and orange mint. Lynda tried several recipes from Salad as a Meal: Healthy Main-Dish Salads for Every Season, none of which were memorable. The tone of the author is a little too “hoity-toity.” Lynda preferred her own recipes for Caesar and Greek salads, but she did enjoy the Celery, Green Olive and Anchovy Salad, since it was something different. The Joy of Cooking’s All about Salads and Dressings has all the classic salads, as well as every dressing you could possibly think of and a lot of great “how to” information. 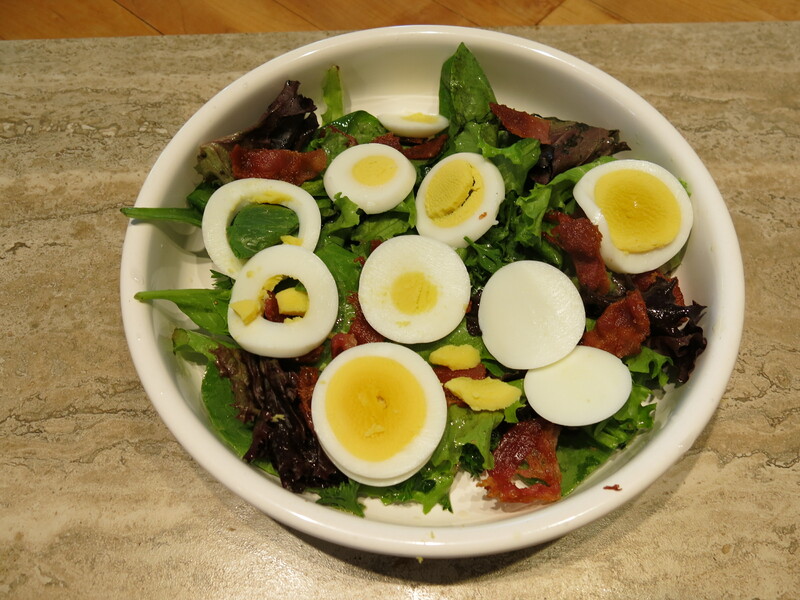 Ed made the Spinach salad with loads of bacon and eggs. Salad for Dinner: Simple Recipes for Salads that Make a Meal has good instructions and suggestions, such as mashing your garlic and putting it in vinegar to let the flavours bind before making your dressing. 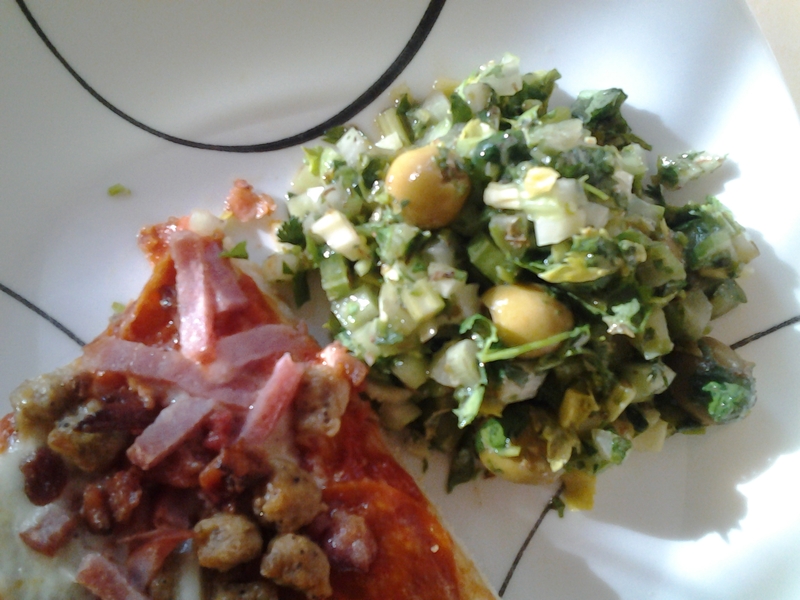 The Warm Cabbage Salad and the Lentil Salad were both delicious. 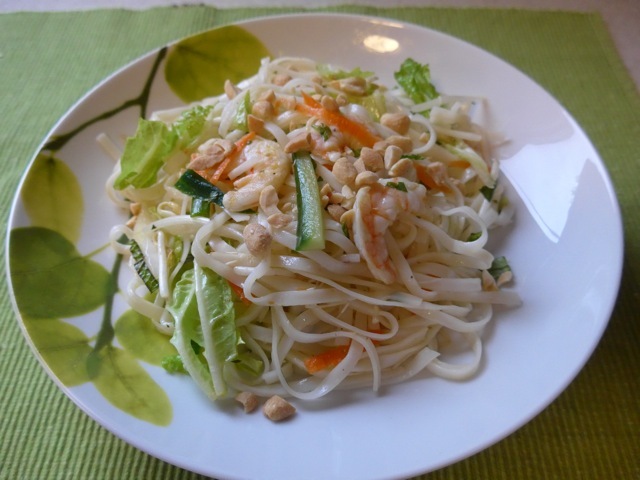 The Vietnamese Noodle Salad with Shrimp, from Salad Makes the Meal : 150 Simple and Inspired Salad Recipes Everyone Will Love was ok, after a few adjustments – rice noodles instead of angel hair pasta, green onion instead of white onion, and the addition of chiles and mint. It made a huge bowl and was sort of like eating a giant salad roll without the wrapper. The Cookbook clubs will start again in the fall, including a new club at Millennium Library, so be sure to check out the September/October issue of At the Library for information about registration. Cook by the Book: Soup’s On! Soup: the ultimate comfort food. It warms you up on a cold winter night and even has the power to fight the common cold. You can make it as simple or as complex as you like and it’s very adaptable. You can also throw it in the slow cooker or let it simmer on the stove all afternoon, while you attend to more important things – like that book you just picked up from the library. Some very creative people have come up with great ways to share their love of soup – from Soup Sisters and Broth Brothers, providing care and comfort with hot bowls of soup to women and children in shelters, to “Soup Nights” popping up in neighborhoods across the country. Soup Night is all about building community, through soup. Once a month, one house on the street hosts a soup night, making large quantities of soup. The neighbors provide the salad, bread and dessert and also their own bowls and spoons. It’s a wonderful way to get to know your neighbours and helps people feel less isolated: “Soup night has become a way for people to come together when it’s cold outside, and it’s created a community on this block in ways that no one could have anticipated.” (Jessie Mindlin, Portland). There’s also the Soup Peddler, David Ansel, from Austin, Texas, who started delivering soup on his bicycle and became so popular that he had to hire a whole fleet of bicycle peddlers to keep up with demand. Melt butter with oil in a large pot. Add onions and stir to coat them. Cook over medium heat until onions begin to soften (20 or more minutes depending on the size of the pot). Stir in thyme. Reduce heat to low, cover the pan and cook the onions for about 30 minutes, stirring frequently, until the onions are very soft and golden yellow. Uncover pot, increase the heat slightly and stir in the sugar. Cook until the onions start to brown (15 to 20 minutes). 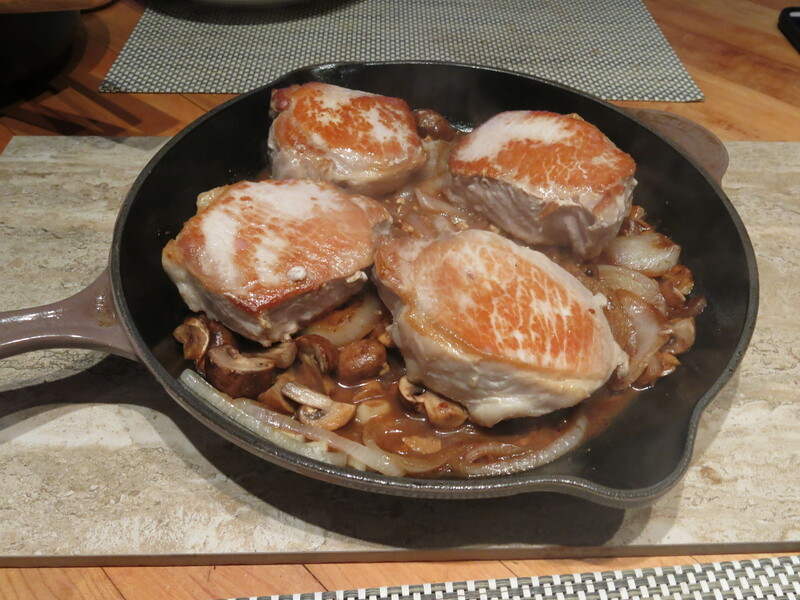 Increase heat slightly, stirring frequently, until onions turn a deep, golden brown (30 minutes). Bring stock to boil in another pot. Stir the flour into the onions and cook for 2 minutes. Add the hot stock and sherry. Season soup. Simmer for 10 to 15 minutes. For those who like the bread slice in their soup, put a piece of day old bread or baguette slice into the individual onion soup bowl. Cover with the soup and top with shredded gruyere cheese. 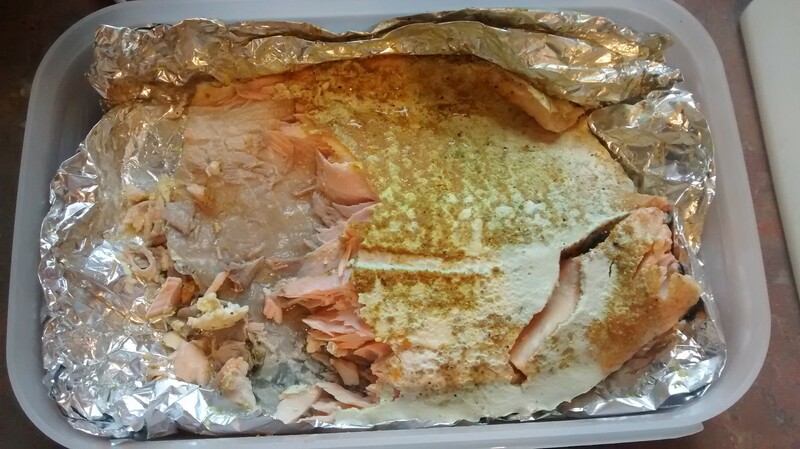 Put under broil and broil until cheese is bubbling and melted. This soup yields a thick soup. Those preferring more broth in their onion soup are advised to use 7 cups of broth. A large soup or stockpot is needed for this recipe. Vegetarians can replace the beef stock with a hearty vegetable stock that has a deep flavour (attained through somewhat caramelizing the vegetables before adding the water). If you’re interested in the history of soup, check out An Exaltation of Soups by Patricia Solley. It has soup recipes for just about every occasion you can think of – from celebrating marriage to honoring the dead, and is also full of interesting stories, poetry and quotes. Here’s the rest of the cookbooks that Cook by the Book tried for Soup’s On night, with our photos of the finished product. Mmmmm! Cooking Light Soups and Stews tonight! After watching Top Chef New Orleans this winter, I thought it would be fun to explore the world of Southern Cooking. The Southern States are well known for their fried chicken, BBQ, buttermilk biscuits, collard greens, gumbo, grits and of course, bourbon! Virginia decided to use an old Southern cookbook she had at home, Delicious Heritage. “The recipe book is easy to follow – very down home, but I had trouble justifying some of the recipes as they were not what I’d call ‘healthy.’ Too many processed ingredients and fried stuff.” She decided to use the always reliable Looneyspoons : low-fat food made fun cookbook for her Jambalaya recipe. Nadene wasn’t very excited about The Lee Bros. simple fresh southern : knockout dishes with down-home flavor cookbook, but was planning on making the strawberry wine coolers on the May long weekend. 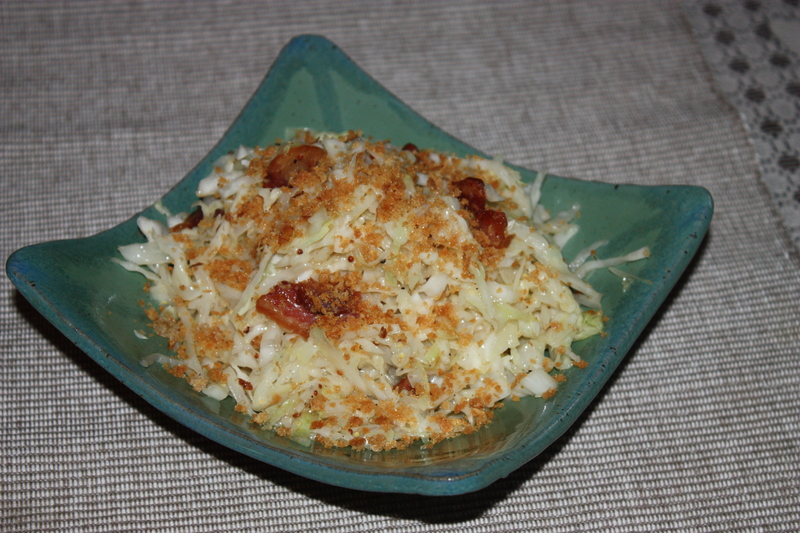 Unfortunately, the cabbage and lime salad she made was inedible and had to be thrown out – too much salt! Ed was born in Texas, so he knows a thing or two about Southern cooking. He decided to try out Smoke & pickles : recipes and stories from a new southern kitchen and discovered a lot of similarities between Korean and Southern cooking, such as BBQ and pickled foods. Ed made a Bacon Kimchi and brought a sample for everyone to try – very interesting flavours and it had a real kick to it! The slim down south cookbook features recipes for “eating healthy in the land of biscuits and bacon.” The authors suggest you can still eat Southern style once a week, then eat lots of fruits and vegetables for the rest of the week. Jackie made the Bourbon Balls, which were a big hit at our meeting. Elaine came across a White BBQ Sauce made with mayonnaise in Southern plate : classic comfort food that makes everyone feel like family. This cookbook has interesting stories and would appeal to bakers, since desserts comprise about 8o% of the recipes. Tanise made the Asparagus and Leek Soup from Essentials of Southern cooking : techniques and flavors of a classic American cuisine and said it was “absolutely wonderful.” Instead of throwing out the tough ends from the asparagus, you make a stock out of them which adds incredible flavour to the soup. The book contains great cooking tips, such as placing fried chicken on a rack, so it will stay crispy until serving time. I made the Crab Cakes with Lime Mayo from Down home with the Neelys : a Southern family cookbook and although they didn’t stay together very well, they tasted great, especially with the flavored mayo. I couldn’t find any “zatarain’s crab boil” spices for their pickled shrimp recipe, so I made my own from one I found on-line. They weren’t as tasty as I had hoped, but they sure looked good in the jar!